“Meow~ It looks so delicious!” Catty Fatty stares at the dried fish hung high on the shelf drooling. All cats are attracted wondering how they can reach the yummy fish beyond their leap. They come up with the idea of stacking on each other’s back so as to grab the fish. Let’s help them make a tower of cats! Seven Cat Cards are dealt to each player. The game starts with the youngest player. In clockwise order, each player takes a turn to roll the die, and acts according to the image shown on the die result. 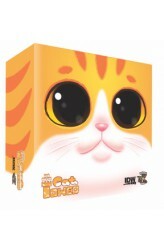 The game ends immediately when one player gets rid of all Cat Cards in hand. https://youtu.be/utPQeOk6aYc .. 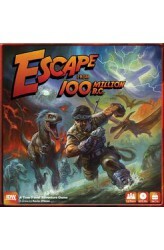 In Escape from 100 Million B.C., players are stranded time travelers, hurrying to reassemble their ship because a nearby volcano is about to blow. There are dinosaurs to dodge, time rifts to close, and castaways from other eras who got pulled back due to paradoxes. Each time traveler has unique abilities and stats which will aid in repairing the time ship. You must be careful not to disrupt the timeline too much or the volcano will erupt, wiping out proof of the expedition altogether. 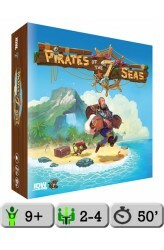 https://youtu.be/1whzcsPIv64 ..
Pirates of the 7 Seas is an innovative, fast and competitive board game full of events from everyday pirate life: plundering, old maps, and horrible gigantic krakens. Adventures, new ports and powerful rituals are waiting for you. Sometimes pirates have to rely on the other pirates, but don't forget that you can get stabbed in the back anytime. As the waves break on your ship, take a turn for the topsy-turvy motion of the ocean by rolling your ship dice — but remember that where they land on the board means as much as what you roll! Choose to remain an independent vagabond, or maybe cut a deal with a Governor to become all official-like in your pirating ways. Consult with a shaman to curse the other pirates or pay a visit to the cartographer to find a map with some hidden trea.. In the wilds of Africa, lion prides rule over all beasts, but only one pride can rule over all the lions! 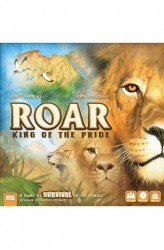 In Roar: King of the Pride, three to six players compete to become the dominant pride of Africa. Managing your food supply, while expanding your territory and growing your pride size with cubs, will take strategic planning and key wits. Even the best-laid plans, however, can be interrupted by other prides' secret objectives, or worse…the encroachment of a new and deadly threat. https://www.youtube.com/watch?v=1HfQYws9Fgo ..